"H2 Toyota Mirai: Fuel the Future"
MR HUGO SPOWERS | Company Architect - Riversimple Movement Ltd.
"H2 infrastructure. Simple & challenging"
"FCH JU: making hydrogen and fuel cells an everyday reality in Europe"
"Deployment of Hydrogen and Fuel Cell Technology in Germany"
"The New Scottish Energy Strategy with Hydrogen & Fuel Cells for Local Energy System Decarbonisation"
"Challenges for Japan’s Energy Transition - Hydrogen Basic Strategy-"
"The role of cities and regions for European hydrogen and fuel cell development"
"Canada Country Update: Initiatives on Hydrogen and Fuel Cell"
"Hydrogen economy at cross-roads : now is the time"
Oral presentations will be scheduled along 6 Parallel Sessions, with presentations simultaneously running in several rooms. 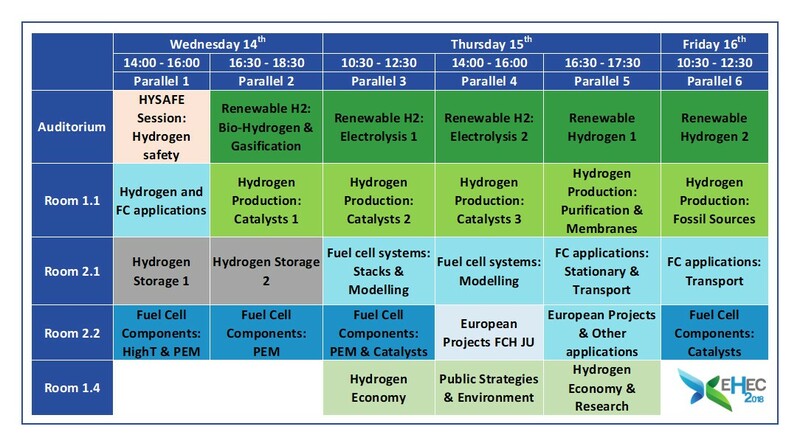 The Parallel Sessions timetable is available here. Posters will be showcased in common areas during the whole event and there will be two Poster Sessions where poster authors are requested to stand close to their posters in order to explain their communication. 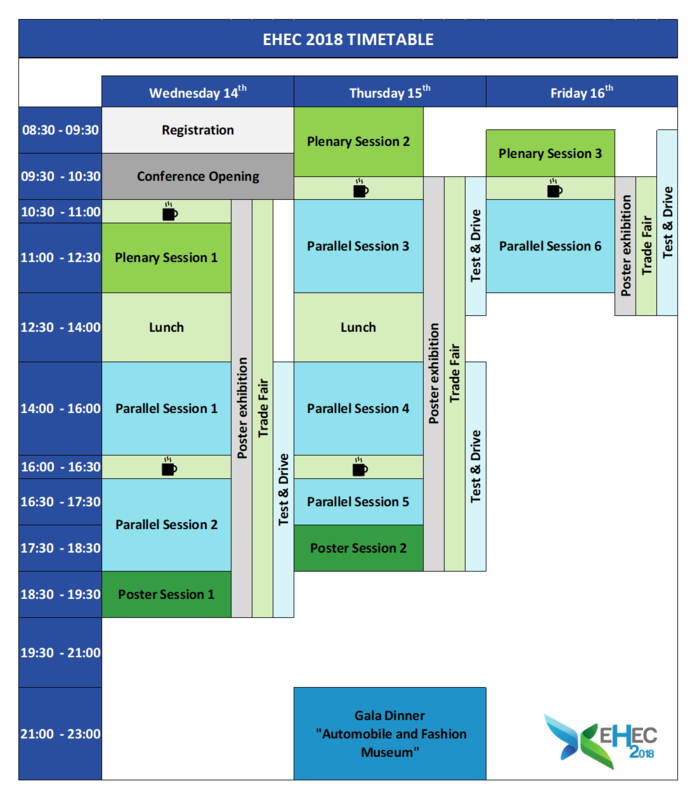 The detail about oral and poster contens can be found in the EHEC 2018 Program. Store all your files in a unique folder, especially videos (make sure videos play automatically when the slide is displayed). Office 2016 and Windows 10 will be used in lecture rooms: developing in previous versions could lead to format changes. 16/9 slides format is recommended. Mac users: please don’t forget to bring your adaptor. Transport your file in a USB to the Technical Secretariat & Speakers’ Room. Please, come the day before or at least 2 hours before your lecture. Our technicians will transfer your presentation to a server. You can then rehearse your presentation with their assistance. Via network your presentation is made available on your lecture room, on a presentation computer operated by a technician. There will be no possibility to connect your laptop. It won’t be possible to make any changes in the presentation once in the meeting room. Oral presentations will last 15 minutes. There will be 5 minutes more for discussion and Q&As. It is important to adjust to the precise timing. Maximum poster measurements:Width: 90 cm. Authors are responsible for bringing their printed posters to the event. Posters will be on display at EHEC 2018 from the beginning to the end of the conference. Additionally, there will be two Poster Sessions (Wednesday 18.30-19.30 and Thursday 17.30-18.30), where poster authors are requested to stand close to their posters in order to explain their communication. Posters have been identified by a specific Poster Code (different to the abstract code) which can be found in the program of the conference. This Poster Code will be indicated on each poster wall at the venue (e.g. P-00). Material to affix the posters to the poster wall will be provided. We strongly encourage presenters to mount their posters as soon as they register. All posters should be removed after the end of the event on Friday, March 16th before 13.00. Use bold typefaces to emphasize the title of the poster in order to enable a legible reading from a distance of 2–3 meters. Use charts, pictures and photographs to portray information and make the poster more attractive to readers. Handouts can be distributed in order to provide extra information to delegates and promote your work. Copyright © Spanish Hydrogen Association. All Rights Reserved. // City and venue images by: © Área de Turismo. Ayuntamiento de Málaga.